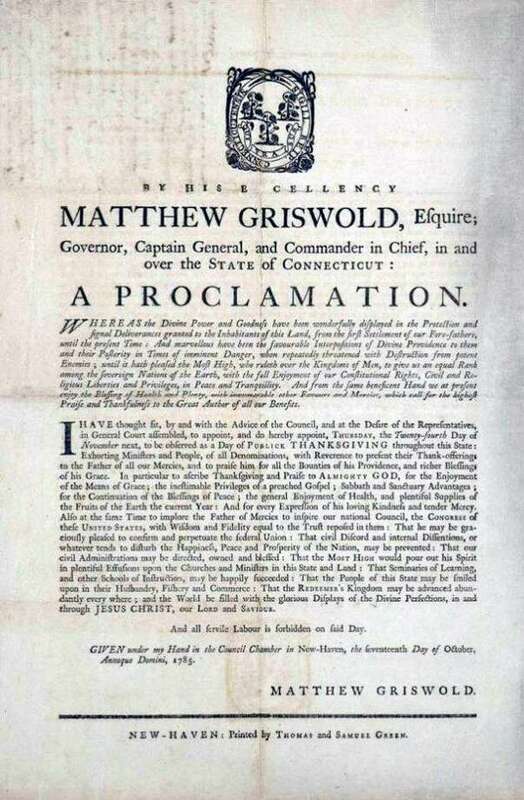 Thanksgiving Proclamation by Connecticut governor Matthew Griswold issued in 1785. Most credit the Pilgrims of Plymouth Colony as being the originators of the Thanksgiving tradition — though, as historians point out, settlers in what are now Texas, Maine and Virginia held earlier celebrations in a similar spirit. It is the Pilgrims’ 1621 gathering, however, that became the touchstone throughout the colonial period and into the 19th century for official days of feasting or fasting, depending on the year’s fortunes. There was no set month or date for these observances to take place, and it was common for the colonies and later the states to issue proclamations. Thanksgiving did not become an annual national observance until 1863 when, on Oct. 3, President Abraham Lincoln issued a proclamation declaring the last Thursday in November National Thanksgiving Day. In 1941, Congress moved that date to the fourth Thursday in November. The year Thanksgiving became a national holiday by proclamation of President Abraham Lincoln.